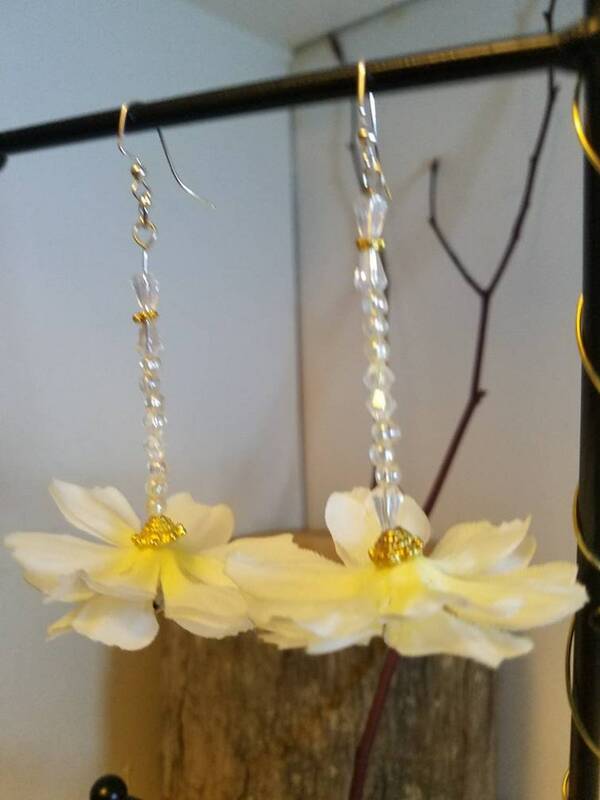 Elegant all white and Crystal flower earrings "Diane"
Command your day to begin with inspiration and excitement with these beautiful, one of kind, handcrafted flower earrings. People will stop you and say" Wow, your earrings are beautiful." you say" Thank you, i got them from Tiffany Celeste." Please buy and refer your friends. Natural white , wood and flower earrings "Nakia"
Summer statement pink flower earrings "Bre"
Lilac soft flower earrings "Nala"
Colorful ticker white flower earrings "Betty"
Deep blue /pink and green flower earrings "Anna"
Tear drop sunny black and neon flowe earrings Suzy"
I love these!! I wore them a few days after I received them. I love my earrings. I can't wait to wear them. Ocean blue , bold red and blsck flower earrings "Monica"
Green white and black flower earrings " Lana"
Classic Crystal and Rose flower earrings " Rosetta"